Happy day after Thanksgiving! I hope everyone had a great day yesterday. My celebration this year was on the smaller side. We have had to cut it down the last couple of years because my dogs don’t behave well with so many people in the house. We were a total of 12 this year and it seemed to work out fine. We visited, ate well, and watched the New York Jets get their butts kicked by the NE Patriots! The food was great. My most recent Cravebox was full of things for Thanksgiving and believe me I used them yesterday. Every year I like to try something new as a side dish. My dish this year was mashed cauliflower. I was surprised – it wasn’t bad. I am told I should substitute this for mashed potatoes to save on carbs, I might have to start doing that. Black Friday officially started yesterday at 8 pm. I find that Christmas is creeping up the calendar every year. While I love Christmas and the holiday season as much as the next person, I don’t like having it shoved in my face the day after Halloween. For that and other reasons, I never do Black Friday – especially when it now starts on Thanksgiving. What used to be a holiday where you celebrated family and were thankful for what you had – you are now gobbling down your meal so you can be in line when the stores open at 8. The whole idea of that just bothers me. Christmas isn’t Christmas anymore. Dear Dad – I miss you! It was 5 years ago today that I (*we – see below) had to make the hardest decision of my life to date. My beloved father was admitted to the hospital because his heart was not beating fast enough. Shortly after he got to the hospital he coded. They tried for a while to resuscitate him. Eventually they intubated him and were able to get his heart beating again. Little did we know it took over 5 minutes for this to happen. All we knew was that he was alive and this brought joy. Unfortunately this joy ended up to be short lived. My father never really came back to us. He subsisted on the ventilator for the next two weeks while we tried to get someone to tell us what was going on. In the end they came back and said that he was probably without oxygen for too long and that he had brain damage and that was why he could not get off the ventilator. term system and insert a feeding tube. There were decisions to be made. My friend and I were in his cubical (he didn’t have an actual room) chatting away. His beloved Red Sox had just won the pennant again. I brought him a championship hat and we chatted about the game like he was right there. At some point he started to get agitated. He hated the ventilator tube. His random body actions would always be to pull that out. I looked him the eyes at one point and said “you know I love you – right?” to my surprise, he nodded his head. Clear as day to me. I had to look at my friend to confirm she saw the same thing. I then said to him “you want that tube out, don’t you?” He again nodded. I cried. Decision made. From that point forward I knew that he did not want to go on this way. Fortunately – my siblings knew that as well. I come from a big family. I have 9 siblings. To get us all to agree on something was nothing short of a miracle, but in this instance, we all knew what my Dad would have wanted. This all takes us to 5 years ago today when we (I was his health care proxy, but this was a decision I would never make alone) made that decision. They took him off the ventilator in the early evening. I stayed at the hospital for a while, but I could not stay until he passed. For me this was the passing of a man that I loved in a way I would never love another. He was my hero, I could not watch him die. My sisters were much better at this, so thankfully he was not alone. To this day I have no idea how they did it – but I am glad that they could. So tonight – I am saying good-bye to you again Dad. You are missed more than you can ever imagine. I love you! Wow – what a day it has been. Started early this am with consistent winds of 25-30 MPH. Around noon time it changed. 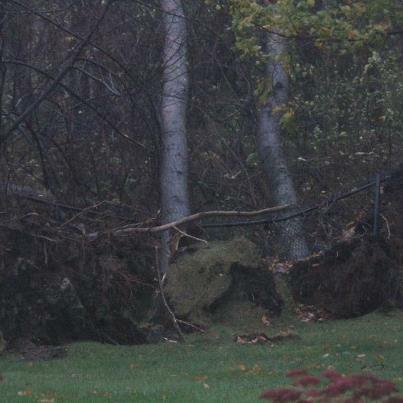 Trees in my yard started to fall. I am very thankful that they were at the back of my yard and fell in the right direction. I think we have just passed the worst of it. I was lucky in that we have not lost power (yet – fingers crossed). Here is hoping that everyone on the East Coast has a better tomorrow. 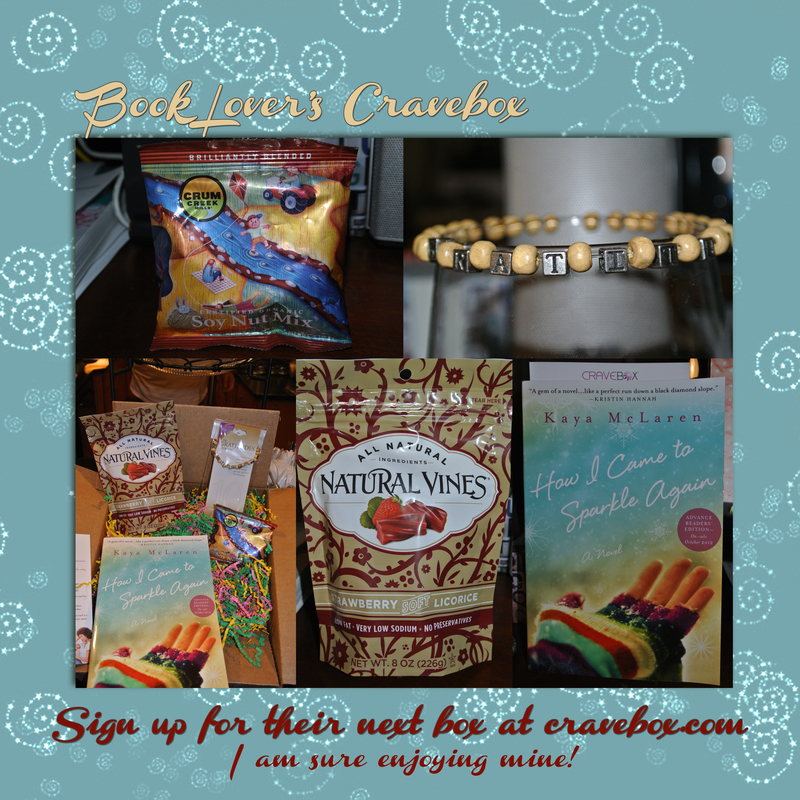 On another note – I received notice that I was selected for the next Cravebox. Very excited because it is a Cooking Light box. This can only hold things that I will love. I will keep you posted. I totally recommend you sign up to be involved with these. I am having a blast! That’s it for now – Enjoy your night. If you live on the East Coast – be safe! Just returned from a brief trip to Miami. On the trip down we ran into Sandy off the coast. It made our weather the first day and a half, very rainy and windy. After that it improved. It remained windy for the duration of our trip, but the sun came out and that was all I needed! The surf remained wild after Sandy moved on. I love Florida in the fall. This is the time of year when it starts to get cold and dark in New England, and it will remain that way for months. Too many if you ask me. The second round of fun came on our return trip. We were the last Boston flight being allowed to leave Miami. Sandy is headed our way and they were making preparations for a very windy and rainy few days. I am not a great flyer. I do it with reluctance, only because I know it is what allows me to get from point A to point B in a reasonable amount of time. So imagine how thrilled I was to hear the captain come over the load speaker and say that he will do his best but there will be turbulence, especially the closer we get to Boston. Yipee… Well, the flight was not the smoothest I have been on, but it wasn’t the worst either. I think knowing that there was going to be turbulence, helped with my usual panic. As much as I didn’t want to leave Miami earlier today, I am glad I did. When the weather is bad and travel is dangerous, there is no place like home… Stay safe everyone! Yesterday was a very nice day. The weather in the end was “make me happy” nice. Since I love to bird watch – it was a great day for that. 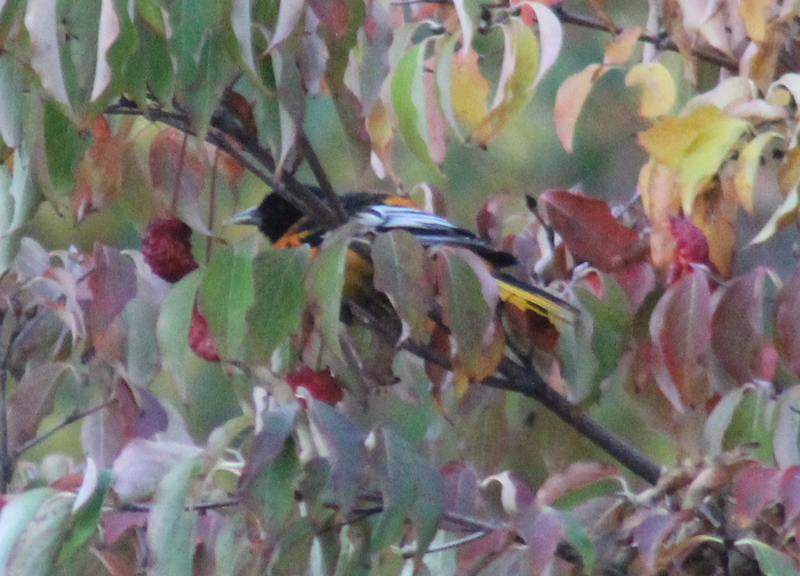 Lots of migrating birds both to and fro… Favorite of the day was the Baltimore Oriole. He stopped by my yard to eat some of the fruit off my trees. Loved the surprise of seeing him. This is not the best picture – but he was loving the fruit on the tree! I also had the opportunity to view a Mocking Bird. Unfortunately he was too far on the out skirts of my yard to get a good picture. I will so miss these guys during the winter. Saw two signs that winter is on its way – the White-crowned Sparrow and the Dark-eyed Juncos have found there way to my yard. Oh well, I will have to face that winter is coming, even if I would prefer it doesn’t. If you read this blog you know I am a big fan of Pinterest. Well if you use the site you may want to check out Brit + Co.
She decided to create kits based on DIY ideas found on Pinterest. I thought this was a fabulous idea, so I immediately subscribed. There is a cost – her sight spells it out. I received my first kit yesterday. Very excited to find out it is all the supplies to make these balloon lights. I really like this idea when I came across it on Pinterest – I pinned it, but the problem was I could not find the blinking lights. Well now I don’t have to look any more. I am doing this for my Christmas party. It is football Sunday so we know what that means… Have a fantastic Sunday! Friday – my youngest and I visited a couple of colleges. It is always a nice time of year to visit colleges in upstate New York. My favorite was Utica college. Though it is on the smaller side, it offered the program my son was looking for. Bonus – it also has a swim team. Not sure what he is thinking yet, but we will find out soon. Yesterday was Sunday and for me that means football. I am an avid New England Patriots fan. Would not matter where I lived, they are the team for me. I have been following them since the Mid 80’s, so I have been there through the bad as well as the good times. 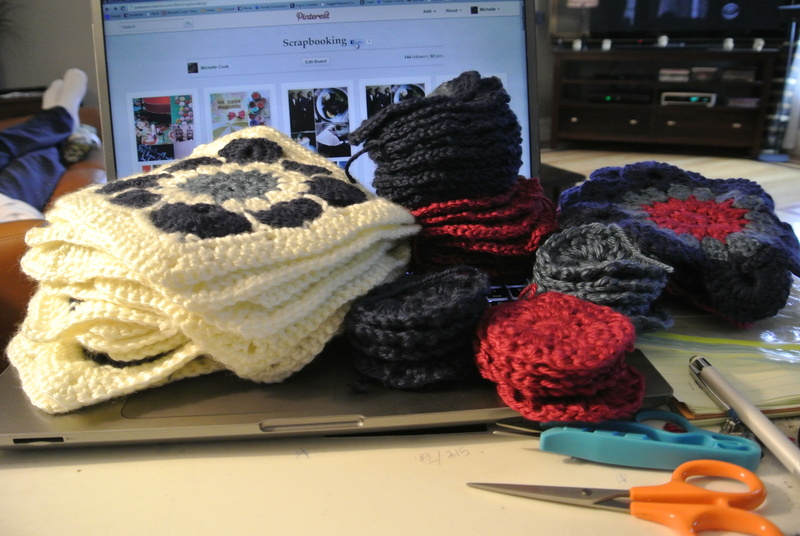 My football game was the 4 pm game, so that gave me time to get a little crocheting done. 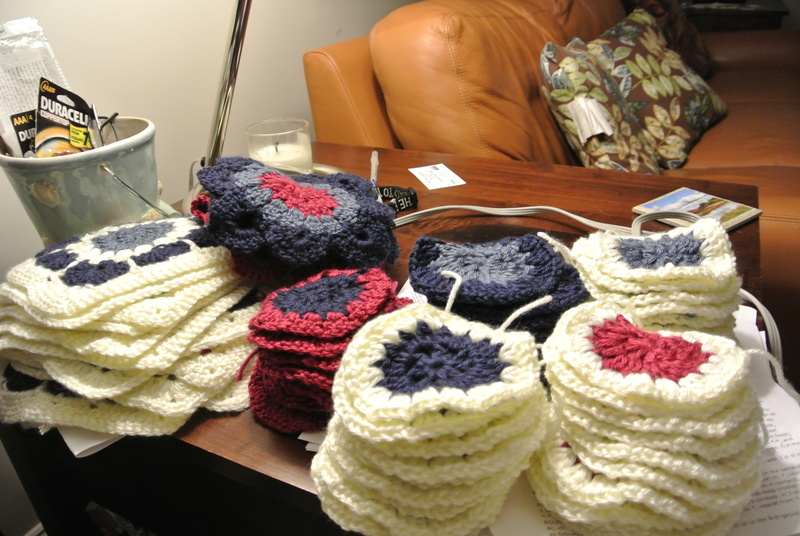 I have been working on a afghan. I found the pattern on this website. I decided to do my own thing and add an additional color. I will post the completed project once it is done. These are pictures of where I was at the beginning of football afternoon and then what I had done at the end. Progress – right! I love having a Monday holiday. It seems to make the entire weekend much better. For me it is a relaxing, catching up on some chores kind of day. Here it is a little chilly, so my dinner choice is comfort food. Planning on meatloaf, mac & cheese, salad and cornbread. I have found a few good recipes for mac & cheese on Pinterest. I have a good recipe from my Mom, but I love to try others when I can. I also like to use whatever cheese I have on hand. This time I added a little smoked Gouda. I also made my own breadcrumbs using some left over rolls I made. I am hoping the family likes it! Back to reality tomorrow. Enjoy the rest of today! Today is Wednesday – normally a nothing kind of night, middle of the week boring. This week it has taken on new meaning. The presidential debate is on. No, I am not going to get political here. You will vote for who you vote for. The important thing is -that you vote! Well others in my family have different opinions and they are very into debates, etc. Me, I look for an escape. Don’t get me wrong, I think it is important that you gain knowledge so you know what you are voting for. But I can figure that out early on and not much they say in these debates will change my opinion. Wasted TV time. So what do I do? I turn to my favorite TV channels – HGTV or FoodNetwork. I love their shows and the commercials do not include political ads – a big bonus as far as I am concerned! Plus – I can learn a thing or two. Today I was excited because I received my first Cravebox. I mentioned that I was expecting this in my last post. I was quite excited to receive it. My guess about the book was correct, so I know I am very excited about reading it. If you want to read the first few pages as I did, go to Amazon. I also received a package of licorice from Natural Vines. I have had licorice before, mostly form the grocery store. Well, I have to tell you, there is a BIG difference. This licorice is soft and very flavorful. I had my son try it as well and he agreed. Another part of the box was a very cute bracelet from Alexa’s Angels, it spelled out Gratitude. When I look at it, it does make me think about what I am thankful for. Go to their website. They have a lot of great gift ideas there. The last (but not least) sample in the box was a bag of soy nut mix. I have to admit, I was a little skeptical about this one. I am pleased to announce that it was good. The bag had soy nuts, but also included a little bit of chocolate. The combination made this work. It was also the perfect snack size. I will be buying from Crum Creek Mills again. This may seem like an advertisement – but it isn’t totally (though to be honest, I want to be selected for more boxes…). I am very impressed with what I received from Cravebox. The products I received are definitely things I will use and seek to purchase in the future. Well, I am off to read my book and eat my snacks. Hope I get picked again soon!